Excerpt from U.S. Coast Guard “Proceedings of the Marine Safety & Security Council” magazine. Read Part I here. Upon the discovery of the vessel, the Marine Safety Office Milwaukee reopened the investigation into its disappearance. 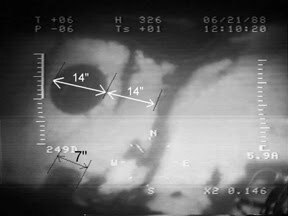 On June 21, 2000, the University of Michigan’s remotely operated vehicle (ROV) obtained video and still photography of the vessel. The ROV also collected paint samples from the vessel, which were sent to the Wisconsin State Crime Lab. Investigators analyzed the video and photographs from the ROV to determine the cause of the casualty. The vessel was found upright at the bottom of Lake Michigan in 260 feet of water, partially imbedded into the lake bottom, with an approximate 20 degree heel to port. The service door on the aft port side of the vessel was found open. A small tangle of fishing nets extended just outside this door. Additionally, there was significant damage on the starboard quarter along the side of the vessel. A wedge-shaped inset centered 14 inches forward of the aft, starboard portlight (see picture below) extended six feet vertically down from the top of the lower deckhouse to just below the rub rail. The upper deck was crushed downward near the center of this inset. The deck was torn upward a few feet aft of the center of this inset. There appeared to be no significant damage to any other part of the vessel. There was no indication of fire on the vessel and no physical remains of the three missing crewmembers were found. Investigators developed a profile of the damage documented by the ROV, compared the geometry of several vessels with the Linda E’s damage profile, and compared the paint samples with those collected previously from vessels in that area. The evidence indicated that the Linda E collided with an integrated tug and barge that transited the waters off Port Washington on December 11, 1998. The MSC’s comparison of the damage profile and the bow geometry of the barge determined that the most likely angle of heel that the fishing vessel would have experienced, had they collided, to be approximately 51 degrees to port. With this degree of heel, the entire port side would have been submerged. 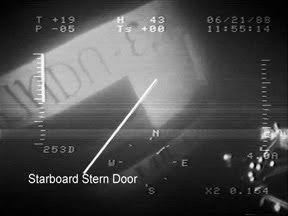 If both the port service door and part of the stern door were open, the MSC estimated that it would take about two seconds to flood the vessel. This would explain the lack of distress signals or attempts to abandon ship. In part III, we will examine the incident and contributing factors. Full article is available at www.uscg.mil/proceedings. Click on “archives” and “2006 Volume 63, Number 2” (Summer 2006).